The Kilties are proud to announce their drum major for 2014 – the special 80th Anniversary Season for the corps. Leading The Kilties from the podium this coming year will be Scott Bradford. 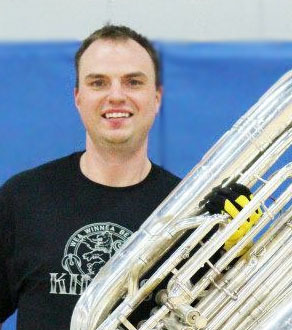 Scott has a Bachelor’s of Music in Tuba Performance from the University of Idaho where he also served as president of the local Phi Mu Alpha Beta Sigma chapter. His drum corps experience includes four seasons as a marching member in the Troopers (1998-2001), one season in the Phantom Regiment (2002) and one season with The Kilties (2013). Scott also has experience as a visual staff member (Troopers), administrative staff and tour director (Blue Stars). Scott is very active in his local music community with current or recent participation in the La Cross Brass Quintet, the La Crosse Symphony Orchestra, the La Crosse Concert Band, the La Crosse Choral Union and the Winona Brass Band. As an undergraduate student, Scott also performed at a professional level with the Walla Walla Symphony Orchestra and Washington Idaho Symphony. Please join The Kilties in welcoming Scott Bradford as the 2014 Drum Major. Posted by News Editor on Thursday, October 24th, 2013. Filed under Current News, DCA News, FrontPage Feature.